Anyone who has walked the battlefield of Waterloo and has strolled through the grounds of Chateau Hougoumont, will know of the simple stone laid to mark the grave of Captain John Lucie Blackman, Coldstream Guards, lying next to the grave stone of Edward Cotton of the 7th Hussars. Neither body actually lies in these graves today, for both were chosen to be amongst the select few whose bodies were interred within the impressive but melancholy Memorial at Evere Cemetery in 1889. But what was the story of this young man who died so tragically that day? John Lucie Blackman was the second son of George Blackman, a director of the Bank of England, who later changed his surname to Harnage to succeed to Belleswardine House in Shropshire. His mother was Mary Harnage, a cousin of his father and the daughter of Lieutenant Colonel Henry Harnage. John Lucie Blackman was born on 4 October 1793, he attended Westminster School until 1808 and then joined the 1st Battalion Coldstream Guards as an Ensign on 5 April 1810. Initially serving in London, Blackman was eventually sent to Spain in early 1812 to join Wellington’s army. The Guards were present at all the major engagements but little used during the campaign of 1812 and 1813; Blackman arrived in Spain just as Badajoz was stormed and was present at the Battle of Salamanca and was fully involved in the abortive attempt to besiege Burgos, where he had many close escapes. He was a witness to the retreat and subsequent march to France in 1813, witnessing the victory of Vitoria and the storming of San Sebastian. Involved in the early combats of 1814 within France, John Lucie Blackman was probably very lucky to return home to the 2nd Battalion on his appointment as a Lieutenant & Captain on 11 January and thus missed the final contest of the war at Bayonne which proved both costly and a futile waste as Napoleon had already abdicated. Transferring to his new battalion which was already in Belgium in a force under the command of Sir Thomas Graham, he missed the failed storming of Bergen op Zoom and arrived only in time to settle into a comfortable billet. This idyll was shattered in March 1815, with the reappearance of Napoleon on the throne of France. His early letters from Belgium go into detail on the confusion and politics of the day and then into preparations for war. Unfortunately his last letter was written on the night of the 15th June as he prepared to march. He fought in the evening at Quatre Bras and then marched with his regiment back to that fateful field of Waterloo. He fought all day in defence of the Chateau of Hougoumont and survived unharmed, but death was not to be cheated of his prize and as the regiment joyfully stepped out from behind the battered walls and shouts of joy rent the air as they chased the fleeing remnants of the massed French hordes from the field; a shot rang out, presumably a last aimed shot from a French veteran before he also turned and ran. The ball struck home, striking the temple of John Lucie Blackman, death was instant; he died in the moment of triumph. His death was witnessed by his men (and possibly by Sergeant Major Edward Cotton of the 7th Hussars) and his body was identified the following day and he was buried in a shallow grave, near the spot he had spent all day defending, in the grounds of Hougoumont. A plaque was erected in the Protestant church near Brussels and a simple stone placed over his grave which remains a poignant reminder of the losses incurred that day although the grave no longer holds him. Apart from his moving story, is there any need for the publication of yet another set of letters from the Peninsula and Waterloo campaigns from an officer in the Coldstream Guards? We already have the letters of John Mills and John Rous published by Ian Fletcher and I have already published those of George Bowles, but yet John Lucie Blackman does have something different to say. Constantly having to explain his ‘profligacy’ to his father, he does something which the others don’t do, that is to explain the minutiae of life as a Guards officer, the costs involved and the kit that was deemed essential for a life on campaign. There are also a number of letters sent by his friend Assistant Surgeon Thomas Maynard, both in defence of his friends financial position, but also adding much important information. Much of this is new and revealing; it paints a very vivid image of the everyday life they led, something which was too mundane for most correspondents but invaluable to military historians. 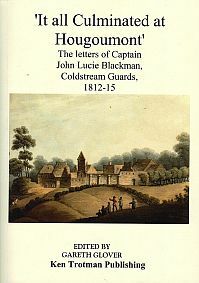 Blackman, does also however deal with the fighting that occurred and is not afraid to criticise his seniors in these private letters to his father, General Graham for example is clearly viewed as too old and ‘past it’ in 1813 and the failures in Holland are firmly planted at his door. Interesting comments are made about building a defensive line on the Pyrenees; specific marksmanship training being carried out by the whole battalion rather than platoon firing and prior warnings having been received of the sortie from Bayonne amongst others. In fact, there is much of interest within these pages and it has been a privilege to work on these letters, it was a bittersweet experience.